Dialogue was nearly lost in the scrap pile – literally. 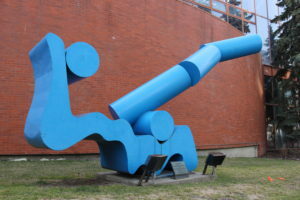 Many Edmontonians remember this sculpture as the tall orange sculpture that sat outside College Plaza on Whyte Avenue and 111 Street for more than 20 years. When the exterior of the high-rise building was renovated in 1992, building managers decided that it did not fit into the decor, and paid $300 to have it taken away. The same managers were unaware that Leadbeater had recently sold a similar sculpture in Calgary for $100,000. The sculpture was stored for a week before Leadbeater caught wind of the situation and purchased it for $25 cash. It was one day away from being crushed. Leadbeater eventually sandblasted it and painted it blue to suit its new location against the red brick wall of the Citadel Theatre. Biography: A descendant of the famous potter Josiah Wedgwood, Roy Leadbeater was born in Ashbourne, Derbyshire, England in 1928, and later abandoned by his parents. After serving in the British Merchant Navy and also as a member of the British police who helped keep peace in post-WWII Palestine, he studied drawing at the Birmingham School of Art. He emigrated to Canada in 1953 and studied drawing on a part-time basis at the University of Alberta under H.G. Glyde.